I want to share with you now what my Dad taught me in the last year concerning his views of how you start something new. James teaches that Divinity and Synchronicity are at work as we obtain guidance to find our perfect destination. They are especially present each time we take on a new project. Therefore, we are working slowly on this website project, and we are primarily by ourselves. My Dad believes there is a Synchronistic process, and the information we are releasing on the website will grow organically as a test of its purpose in other people’s lives. He teaches that investing large amounts of money or time in one place can create FEAR. And this fear will always manipulate your awareness of Synchronicity. When you are forced to act in fear, you do not always make the best decisions for you and those depending on you. You are not free to act in sync with your inner guidance. He used this approach to his writing career in the beginning. He gave his book away and then waited until people asked for it. He believes any information or product that is intended to be shared with the world will be. 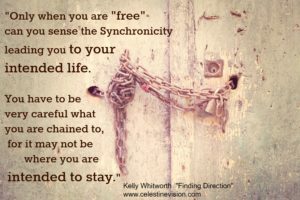 And only when you are “free” can you sense the Synchronicity leading you to your intended life. You have to be very careful what you are chained to, for it may not be where you are intended to stay. This makes perfect sense to me. Can you imagine if large corporations or anyone in a leadership role would adopt this method? Could it inspire “creating work with good intention” instead of working for profit in FEAR? Dad plans to cover this subject more heavily in future articles. He wants to share his views on finance, discovering your life mission and noticing Synchronicity as you start new projects! –We need your patience and support as we develop content, new ideas and work out all of the kinks – the old school way. We really want to hear from you. We want your input on the current topics, concerns and questions your are facing today. –There are four of us managing content, social media, radio and website marketing. We are working hard to see that the website has a fighting chance, and giving time and energy to the community. –The products and services listed on the “Living the Vision” page or that you may see in any “future stores” have served Synchronistic to our family’s personal journey. They have provided health, education and ideas that brought about this website. We believe these products bring health and awareness to the world and our daily lives.